If you fish a lot in shallow water, you know it can be a struggle to get a fish finder that reads out far enough to be worth anything. Not all fish finders are created equal, and if you choose the correct one, it can make shallow water fishing a whole lot easier. Here we will discuss four candidates for the best fish finder for shallow water on the market today at different price points. Fish finders are worth the price you pay. As soon as you have one you start catching significantly more fish. If you’re ready to take your fishing game to the next level, continue reading! In this list, we are going to break down a few of our favorite fishfinders online. Here is an overview of our candidates. The most expensive in our test, the Humminbird Helix 5 SI and GPS fish finder is definitely the top dog here as well. 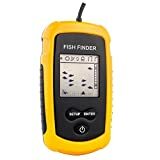 This fish finder was practically built for shallow water fisherman, with side imaging to show you images in a cone 85° away from your boat to each side, at 455 kHz to give you a clear picture as well! This gives you so much range when you are scouting for bait schools or structure it’s ridiculous! This side imaging is good to depths of 100 feet, while if you just use the standard sonar you can reach down to 1,500 feet. With the standard sonar, you have the options of using either 83 kHz for deep water or 200 kHz for better images in shallower water. The screen size on this fish finder is 5″ diagonally. The GPS this comes with is preloaded with Humminbird’s UniMaps system, but you also have the option of using Navionics with it if you purchase it separately. If you have a microSD card, you can also save waypoints or maps from this fish finder as well so you can visit the same spot next time. All in all, this fish finder has the capabilities that many more expensive fish finders have at a great price. The side imaging will open the water up for you in shallow water, and I would bet that you will notice an increase in your catch when you learn to use it effectively. The Raymarine Dragonfly 4 Pro has a beautiful sharp color display that is optically bonded. Meaning this screen should never fog up or allow moisture inside. The screen measures 4.3″ diagonally. This fish finder reads in three frequencies: 50, 83, and 200, with 200 being the most sensitive for the shallow water fishing you are doing. This is what produces their down imaging pictures, which is the clear picture of the bottom you can see in the picture above. The 200 kHz also reads at a 60° cone, which will show you some serious bottom structure while giving you some outstanding pictures. The depth only goes to 600 feet, which shouldn’t be a problem if you are fishing shallow water only. This fish finder comes stock with a GPS system equipped with C-Map Essentials, but it can be upgraded to several different types of maps. You can insert a memory card in order to save your route or waypoints to come back and fish them later. The Raymarine 4 Pro also has another great feature – live wi-fi streaming of the fish finder so your buddies or you can watch it on your phone from anywhere on the boat. No more clustering around the fish finder! For the price, this is another great fish finder for fishing shallow water. The Garmin Striker 4 is one of my favorite options on the list. With a beautiful sharp color display that is optically bonded, this screen should never fog up or allow moisture inside. The screen is an easy to use 3.5 inch colored display. It can display fish at a depth of up to 1,600 ft in freshwater, or 750 ft in saltwater. The unit will display depth, temperature, your movement speed, and plenty more additional information. The Garmin Striker 4 fishfinder makes it so simple to catch fish. With its high -sensitivity GPS you’re able to detect the exact location of fish near you. It comes with their Garmin CHIRP transfucer, which is one of the better ones on the market. This is a very simple and high quality fish finder. It has plenty of features and with its pin point accuracy you are able to use it in deeper waters. The Venterior VT-FF001 Portable Fish Finder is a very basic and beginner friendly fish finder. But it certainly doesn’t lack quality. It comes with a nice adhesive so you can stick it onto the side of your boat to control depth. The depth range is 330 meters and it can also be used for ice fishing. I recommend taking spare batteries with you as it goes through batteries quickly. The screen displays approximate fish location accurately. The backlight allows you to use it at night. 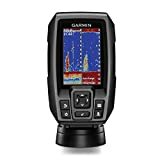 It has everything you are looking for in a fish finder, and it is a fraction of the price of the other ones on the list. One of the best parts about the Venterior VT-FF001 Portable Fish Finder is its great warranty. It is completely covered for 2 years. Not that I’ve had any issues with the one I have. But being able to return an item is always better than not being able to. All in all the Venterior VT-FF001 Portable Fish Finder is a great choice. All Four of these shallow water fish finders discussed above will help you with shallow water fishing, while giving you the option of fishing deeper if necessary. We tell everyone from beginners to pros that a fish finder is definitely worth it. When it comes to fishing in 2019, the importance of a fish finder cannot be understated. Why fish blindly when you could know exactly where to fish. We hope this guide on shallow water fish finders will help you in that regard, Just remember, know your budget and spend accordingly! Good luck and good fishing! Still looking for more fish finders? We have our favorites for under $300 dollars here.